Successfully Added 2-In-1 Bluetooth Headset And Power Bank - Bluetooth 4.1, 900mAh Charge, Ear Hook Design, Built-In Mic (Black) to your Shopping Cart. Small portable and powerful this pocket power bank and Bluetooth earphone combo is about the same size as a lighter or lipstick and easily slips into a purse or pocket. With its fashionable design and sleek styling you get two handy gizmos rolled into one that will surely save your day. 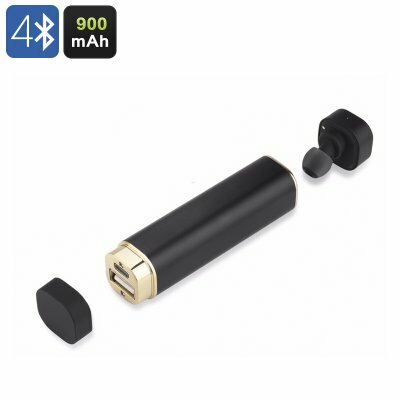 The Bluetooth earpiece is held in place magnetic y and charges directly from the power bank. utilizing the energy efficient Bluetooth 4.1 you can sync it with your Smartphone, tablet, car media player and more. A built in mic means its more than for listening to music and with its one button simplistic design you have do it all with ease. A built in lithium battery allows up to 4 hours of talk time, 5 hours of music or a massive 50 hours in standby. the power runs low reseat it in the power bank to fully recharge. Now you are free to listen to music and take hands free calls wherever you go. Portable and lightweight this power bank is more than for charging the headset. With its 900mAh of juice you can top up your phones battery and get extra life from you electronics on the go. A must have accessory that gets you much needed extra power for an important call, must have selfie or that news breaking Twitter or Instagram feed. Power doesn't get more portable than this and to make sure you'll never run out of juice again or can take a call no matter where you may be its the perfect gadget for any 21st century girl or guy. This compact Bluetooth headset comes with a 12 months warranty, brought to you by the leader in electronic devices as well as wholesale electronic gadgets..